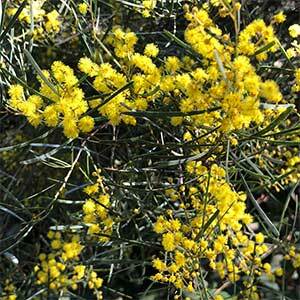 A smaller growing species Acacia williamsonii or “Whirrakee Wattle” can be found growing from Victoria into New South Wales. This is a shrub like plant, masses of yellow flowers in late winter to spring on a small plant that will reach around 2 metres in height. Found growing all through the goldfields areas around Bendigo, it is fast to establish and a good plant for revegetation of degraded areas. With its naturally smaller habit Acacia williamsonii could also be used a a low hedging plant in larger properties. Best grown in full sun and a well drained soil this is a species that will grow well on poorer soils. In can cope with clay soils as long as they are not prone to becoming waterlogged. Height – To around 2 metres, sometimes taller.